Going on holiday is an exciting time, but the getting there can be stressful. If you do not know the "dos and don'ts" of luggage, then it can become a nightmare at the airport. Worry not, as we have everything you need to know about hand luggage when flying with Ryanair, Easyjet and more. All passengers are entitled to bring 1 small bag on board which has to fit under the seat in front of you (40cm x 20cm x 25cm). This can be a handbag, laptop bag, small backpack or a carrier bag. Duty Free bags are also allowed in addition to your allowance. You used to be allowed to carry two items of hand luggage on board, but now you can only do this if you have priority boarding. The new rules stipulate that you can pay to bring a 10kg bag which must be checked in, to be stored in the hold. This bag is then collected at the baggage carousel at your destination. Non-priority customers who have not added a bag to their booking can still purchase a 10kg wheelie bag allowance at the airport bag drop desk for an increased price. 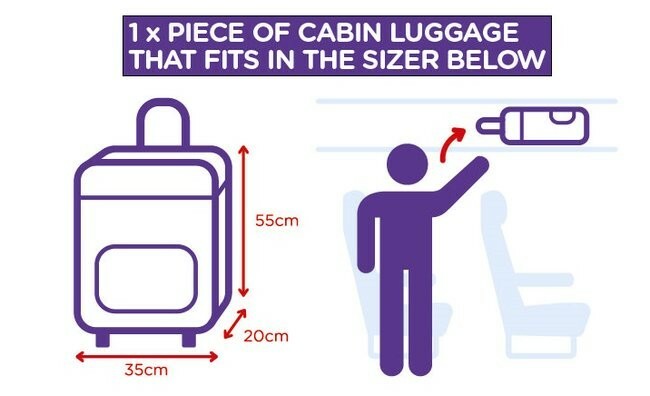 If you have priority, you're allowed to bring 2 bags into the cabin, 1 small bag to go under the seat in front of you and the other, can be a maximum of 10kg to be stored in the overhead locker. Booked a bargain on an easyJet flight? 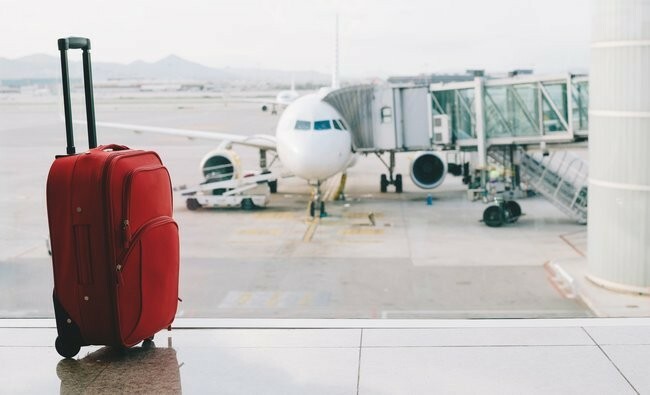 They are notorious for being stiff on their Hand Luggage allowance, so avoid extra costs and ensure your ONE piece of baggage doesn't exceed 56 x 45 x 25 cm. There's no weight limit on your one piece of hand luggage, but do bear in mind you need to be able to lift it into the overhead storage. easyJet flights are usually very busy, pair that with the fact they can only carry 70 bags in the cabin, and you're left with the reality that some will have to be put in the hold if overhead lockers are filled. Nine times out of ten, your bag sizes will be checked, so remember to measure your luggage taking into account the handles and wheels. If your bag is outwith the maximum size, then it'll have to be checked in and you will be charged an excess fee. Flexi, Upfront, Extra Legroom customers and easyJet Plus cardholders may take an additional bag, like a laptop bag or handbag. The maximum size for this is 45x36x20cm. These bags must be placed under the seat in front of you, as there is no room for them in overhead lockers. You may travel with one standard cabin bag measuring no more than 55 x 35 x 20cm (including wheels and handles) and with a handbag or laptop bag (must be able to fit under the seat in front of you. You must not exceed a combined weight of 10kg across the two pieces of luggage. If your cabin luggage is deemed too big then it'll be put in the hold and you'll be hit with a £50 charge, which is payable by card. Jet2* are like the other budget airlines in that their flights are super cheap, but you are restricted when it comes to luggage, unless you pay £££'s. You can take one piece of hand luggage for free, but it must not excess 10kg in weight or 56cm x 45cm x 25cm in size (including any wheels and handles). If you're bag is outwith the allowances then it will be stored in the hold, and it's very likely you'll be charged extra. In addition, you can also take a small bag on board. This can be a handbag, laptop bag or Duty Free purchase in a carrier bag. It must be able to fit in the seat in front for you. IT Luggage is one of the most popular luggage brands in the UK. They produce compact, lightweight wheeled suitcases, that are ideal for those holidays abroad. When shopping for cabin luggage, it's important to get something lightweight and compact, as many airlines have restrictions on size. Another bestselling brand of luggage in the UK, is Tripp*. They are modern looking in design, and a lot of their cases come in bright colours. Ideal for spotting on that luggage carousel. Hold luggage is your baggage that you check in with the airline, before going through security. This is usually your main piece of luggage, and is often included in your allowance if you've booked a holiday package. Hold luggage is held in the hold of the plane, and once you've checked it in, you won't get it until you collect it from the luggage carousel at your destination airport. What can you take in hand luggage? There are restrictions on what you can take in your hand luggage, so unless it's a prohibited item, certain things may go in your hold luggage instead. Liquids, creams, gels and pastes in containers under 100ml, in a single, transparent, resealable plastic bag, which can hold no more than a litre and measures around 20cm x 20cm. Can you take hair straighteners in hand luggage? You can take hair straighteners in your hand luggage. As well as hair dryers, tongs, electric shavers, travel irons and e-cigarettes. What can't you take in hand luggage? What can I take in hand luggage? You can take lots of things in your hand luggage, like clothing, accessories, laptops, tablets, mobile phones and more. Another thing to take into consideration is the amount of luggage and the weight of your luggage. Generally, your allowed one piece of hand luggage and a small bag too - something like a laptop bag or a handbag. Depending on what airline you are flying with, will depend on what baggage allowance you'll get. Many stipulate a maximum size and weight when it comes to cabin luggage.